You mean it’s only Thursday??? 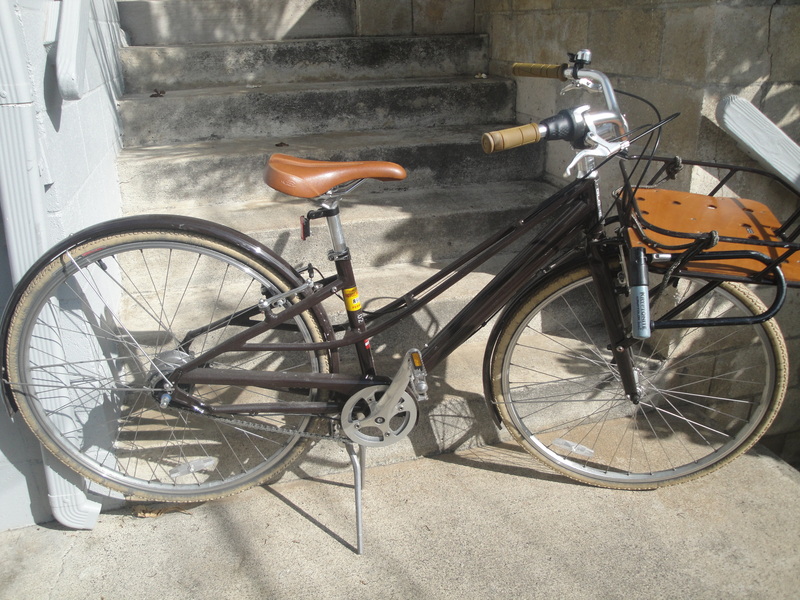 Ok, let’s see, I got to ride my bicycle today! That was fun! Dinner was also a stellar part of my day. 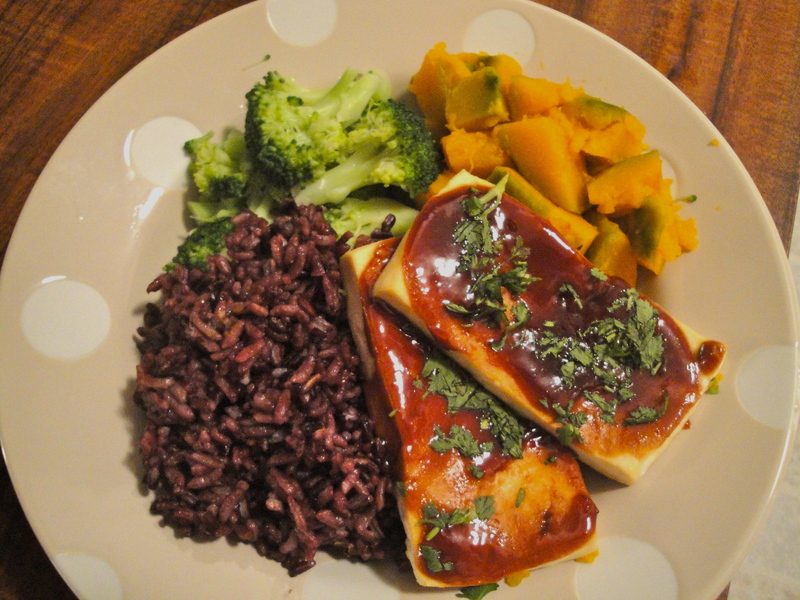 Oven roasted tofu with a hoisin glaze, broccoli, kabocha squash, and black rice. Whole grains- check, nutritious and colorful veggies- check, protein- check. What more do you need from dinner? 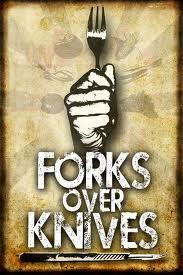 Tim and I watched a documentary called Forks Over Knives about the link between the American meat-heavy diet and the superfluous amounts of heart disease and cancer. I already knew most of the information in the movie, but what was really interesting was the different scientific studies done on different populations in different areas in the world. I was aware of the problem with American diets, but it was really enlightening to see evidence of the corrolation between animal-based foods and disease in populations all over the world. For example, studies were done in China between urban (where they eat a more Western diet) and rural (where they eat a plant based diet) communities and the difference in the presence of disease was staggering. I highly suggest you watch this movie, you can stream it for free on Netflix. This movie has me seriously considering a vegan diet. I only eat yogurt and cheese on a daily basis, and this is mostly for their protein content, and fish on occasion. So I don’t think it would be a difficult thing for me to do, I just feel like I need to do some homework about sufficient protein intakes and sources, with all of my running and activity. Any thoughts about these issues at hand? Are all animal-based sources of food degenerative and negative for your health? How do you make sure you get enough protein in your diet? Are all animal-based sources of food degenerative and negative for your health? I believe at this time that animal meat can be a very healthy part of your diet. I would only suggest animal-based protien from animals that are strictly herbivours. Also as important is that the animal must be aloud to be the animal it was intended to be. Joel Salatin is a good source of information on healthly animals = healthy people. You should check out the vegan chick! Your protein levels will be fine! I just got done re-watching some of DR. Max Gerson’s research. It totally makes me regret my past breakfast’s this month. Oats in the morning it is! I know! It really makes me reconsider eating animal products at all!